Save the dates in November for FABTECH, as 1500 exhibitors will greet 40,000-plus attendees in more than a half-million sq. ft. of space at McCormick Place in Chicago, IL. FABTECH (www.fabtechexpo.com) provides a one-stop shop for meeting with world-class suppliers, experiencing the latest industry products and developments, and finding tools to improve productivity, increase profits and discover new solutions to metalforming, fabricating, welding and finishing challenges. To ease navigation for attendees to products and services of specific interest, the show floor is organized by its sponsors—the Precision Metalforming Association, Fabricators & Manufacturers Association International, American Welding Society and the Chemical Coaters Association International—into technology areas. 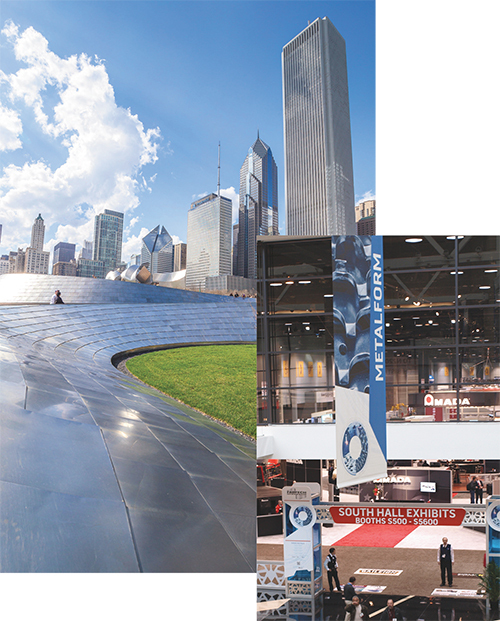 Beyond the show-floor offerings, FABTECH provides a full conference program, with the major sponsors overseeing technical sessions covering all aspects of metalforming and fabricating. The event includes more than 100 targeted technical, operational, economic and managerial sessions. Attendees at these sessions discover solutions needed to advance careers as well as companies’ fortunes. Network with peers, learn from top industry experts, exchange best practices, and explore the latest technology and advancements in the industry through FABTECH’s educational sessions. For details, see PMA’s education program, designed to help metalformers advance their businesses, beginning on page 38 of this issue. Technology, networking and education provide plenty to justify attending FABTECH, but this expo offers much more. Make plans to stop by the keynote presentations, panel discussions, AWS Welding competitions and Additive Manufacturing/3D Printing Center, and be sure to join colleagues for a special FABTECH Industry Night. On Monday, Nov. 9, NASCAR champion Rusty Wallace stresses teamwork in his FABTECH keynote presentation, “Running a Winning Organization,” slated for 9 a.m. in the Grand Ballroom. Wallace’s discussion focuses on, just as a driver relies on his team and pit crew, so, too, must an organization rely on the talent, experience and knowhow of its employees through teamwork. This keynote starts the FABTECH engine, which will be running on all cylinders as industry experts take the stage at 12:30 in the FABTECH Theater for a 1-hr. featured panel session, What Additive Manufacturing/3D Printing Means for the Metal Fabrication Industry. Business leaders in the additive-manufacturing industry will discuss the current state of this technology, and where it is going. What are the new challenges? How should a company invest in the technology? How does this new type of manufacturing change the way that we do business? Join Women in Manufacturing, PMA and all of the FABTECH show partners on Wednesday, Nov. 11, from 7:30 to 10:30 a.m. for Women of FABTECH Breakfast and Tech Tour, a networking breakfast celebrating the importance of women in the manufacturing sector. In Ballroom S100 at McCormick Place, hear a keynote presentation from Karen Kerr, GE Ventures, on innovation in advanced manufacturing, followed by a technology tour of FABTECH. Price: $15. For more information, visit www.fabtechexpo.com. Attendees can gain perspectives into this technology in terms of making metal parts and how the continued evolution of technology and pricing structure affect high-mix, low-volume manufacturers as well as reducing the cost of complex part production for metal manufacturers. The panel includes Carl Dekker, president, Met-L-Flo, Inc.; Bob Markley, CEO, 3rd Dimension Industrial 3D Printing; Rick Neff, manager of market development, Cincinnati Inc.; and Bryan Crutchfield, managing director, Materialise USA. At 12:30 on Tuesday, Nov. 10, the FABTECH Theater hosts another panel session, Enterprise Security Risks: Is Your Company Protected? The threat of enterprise security breaches and compromises has become one of business’ greatest—and most unpredictable—risk factors. An increasing number of companies are falling victim to internal and external threats, and the manufacturing industry is no exception. This session offers a comprehensive look at the current threats manufacturers’ face, the security vulnerabilities they exploit, and the potential impact on an organization. Attendees will receive critical information and guidance on developing a security strategy that deploys the latest and greatest technologies available to protect a company’s valuable information and minimize disruption to customers, operations and productivity. Moderator Jay Monahan, SAP director–global shop floor for Dell’s Business Application & Technology Services, leads a panel that includes Dr. Dong Wei, cybersecurity research scientist, Siemens Corporate Research; Dominick Glavach, principal IS security engineer, Concurrent Technologies Corp.; and Jay Conolly, director of commercial solutions, Prescient Edge, LLC. Join your peers for discussion on hot topics, a networking lunch and opportunities to gain insight into the general state of the slideforming industry. Price: $50 per PMA member, $100 per nonmember. Hear TED talks from FABTECH experts on issues affecting the tool-and-die segment of the industry. Brief presentations will be made on high-strength steels, die cushions and lubrication, followed by the opportunity to network with speakers and your peers over cocktails. Price: $50 per PMA member, $100 per nonmember. Hear prominent speakers on topics such as international business, understanding and embracing your leadership style, business succession/transition planning, terms and conditions, and more at PMA’s second Executive Development Academy. Price: $1500 for first PMA member; $1125 each for two or more members; $2000 for first nonmember; $1,500 each for two or more nonmembers. On Wednesday, Nov. 11, a featured panel session, State of the Industry Executive Outlook: Advanced Manufacturing, will take place from 12:30 to 1:30 p.m. in the FABTECH Theater. Panelists Marni Rutkofsky, director of strategy and marketing, GE Ventures; Robert Henderson, director of additive manufacturing, Linear Mold & Engineering, Inc.; and Tom McGaughy, director of technology, Edison Welding Institute will discuss how they stay on the forefront of manufacturing technology advancements and how they deal with these disruptive technologies as they relate to new-product introduction, supply chain, customer interaction and advanced automation. The Professional Welders Competition, sponsored by AWS, will take place in Booth C1844 throughout the run of FABTECH. Professional welders can sign up onsite to compete for a $2500 first prize, a $1000 second prize and a $500 third prize. Contestants will make a single-pass SMAW weld with E7018 on low-carbon steel. Speed and quality will be the criteria.